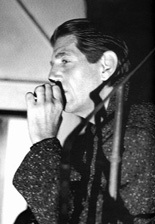 It was while filming Bitter Moon in Paris that Coyote made friends with Nino Cerruti, who dressed him for the film. Cerruti liked the way the actor looked so much that for the past year he has used him to model in his menswear advertising campaign. 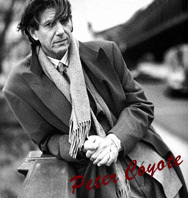 He (Coyote) was flattered: "I think he wants to see grown men wear his clothes - men who might have the money to buy them." 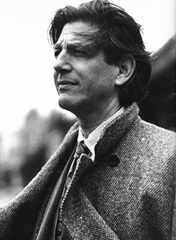 In a new Roman Polanski film, Bitter Moon , actor Peter Coyote wants to howl about the clothes designed by Nino Cerruti. "Oscar begins in a kind of royal purple," Coyote says of the clothing designed for the character he plays. "He is spoiled as a young prince at the film's beginning and his costume for seduction and pleasure is his purple suit. There is such an intimate relationship between clothes and character... 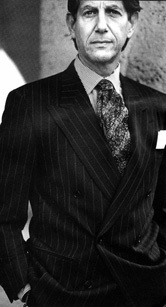 I like the way Nino Cerruti lives. I suppose that is why I like his clothes." Cerruti says the clothes "had to be intelligent, much more than just clothing, a true reflection on the personality of Oscar in the film."